It's hard to be both brilliant and competitive at the same time, but the world famous Australian bike pilot Wayne Gardner got to be brilliant in the late 80s and early 90s over his competitive ride by the Honda factory team. He won his first race in the Spanish circuit of Jarama, and reached the World Championship in 1987. 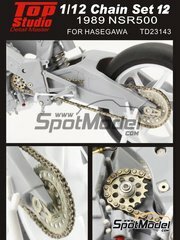 A few weeks ago we introduced the Honda NSR500 kit by Hasegawa he rode in 1989, and now we bring the brilliant detail sets by Top Studio for this beauty: a chain set, a front fork and the full detail-up set. 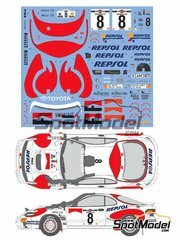 Japan manufacturers, the most brilliant and competitive in the scale modeling world without any doubts, delights us with new decals and some reeditions. 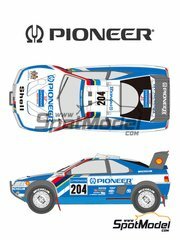 By Sunko Models: decals for Dakar Rally Peugeot 405, DTM Opel Calibra V6, Kankkunen and Auriol's Celicas of 1993 and 1994, Carlos Checa and John Kocinski decals for the 1998 NSR, Sainz's Celica at the '92 Safari Rally, and the gorgeous Toyota Supra GT sponsored by Marlboro, all of them for the old Tamiya kits. 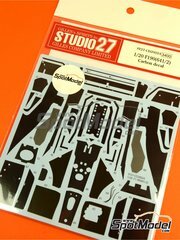 On the other side, Studio27 has released to the market two carbon fiber patterns, this time for the Ferrari F189 by Tamiya and the Ferrari 641/2 F1-90 by Fujimi, along with photoetched parts for Schumacher's Ferrari F310B. And for deserts, the HB logos for the '90 NSR500 by Tabu. 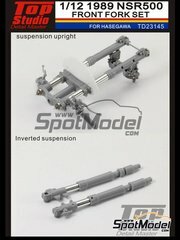 Set of turned metal and CNC machined parts for enhancing the front fork of your NSR500 scale model. The pictures just speak for themselves!! 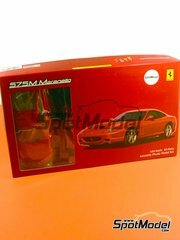 Make room urgently in your workbench, because your NSR500 scale model needs this detail up set. Inside the box, you'll find a thousand part for improving your kit: golden photoetched parts for the front brake disc brackets, resin parts for replacing the clutch and bringing electrical connectors to life, silver photoetched parts for the brake discs and all kinds of mechanical parts, turned metal parts for the front fork and gear shift lever, and a thousand more. You can't resist!! You can now enhance the plastic chain included in the kit and build this one one link at a time exactly like real life chains are built. The looks of the finished chain are incredibly real. 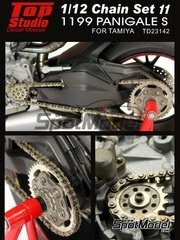 Forget about the dull plastic chain that comes with the kit and mount this gorgeous chain set assembling it one link at a time, exactly the way real chains are built. The look of the chain once finished and mounted is just as mind blowing as you can see in the pictures. 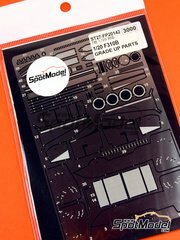 Set of photoetched parts to rocket the detail level to the stratosphere on the Tamiya scale kit of the F310B, that collected so many glories for the Ferrari team. 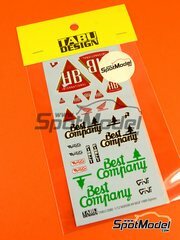 Set of HB logos for your 1989 NSR500 scale model kit... do NOT miss them!! 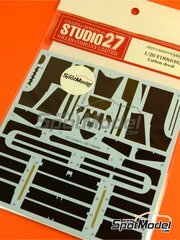 These two decals sheets included in this Studio27 reference contain all the carbon fiber and kevlar patterns you need to give that touch of realism that the Tamiya scale model deserves. Don't hesitate, the product is reaaaaally good. Pictures doesn't do any justice to the impressive and colorful design of this decals sheet. You have to see it to believe it: ultra thin lines, hyper intense and saturated colors, delicious details. Highly recommendable. A new and elegant decoration by Shunko for replacing the original decals of the kit, designed with both mind-blowing taste and careful detailing. 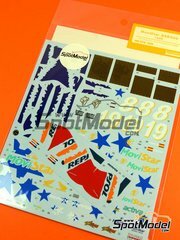 Don't hesitate for a second and replace the original scale model kit decals with these delicious, brilliantly designed, awesome manufactured, colorfully painted and stratospherically detailed decals. 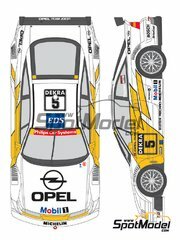 Back in 1995, Tamiya announced the Opel Calibra with the white and yellow decoration from the DTM. A few years have passed and we're quite sure that the decoration of your kit now looks yellow and yellow, and it's time to retire those decals, right? 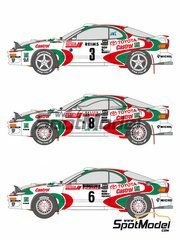 Don't hesitate about it and use these gorgeous decals from Shunko in your Opel Calibra. We promise you that this decals are hugely better than the originals. The colors, but mostly the mirror stripes around the number pads are infinitely better than the decals included in the kit. Don't procrastinate or you might miss yours. 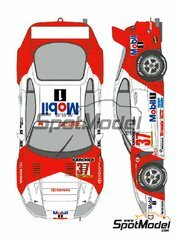 Two versions of these decals for both the Montecarlo and Sanremo rallies, fitting your Tamiya kit like a glove. A very interesting kit of the kind you build in a weekend, since it does not include a detailed engine or complicated assemblies. Just 100% percent enjoyment! !